This is one of the last pieces in the repeatable mystery series. 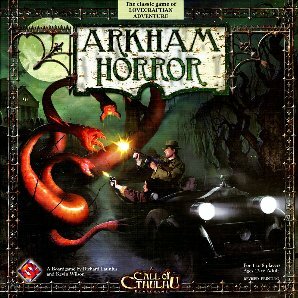 I’ve talked about Arkham Horror a lot on my blog. If you comb the archives, you can see I’ve developed some resources for playing the game, and I’ve analyzed it pretty thoroughly. I have a pretty genuine love-hate relationship with Arkham Horror’s random mechanics. And yet I’m intrigued by its storytelling potential. Since I’ve covered it so much in the past, I’m going to skip to the part where I talk about what I think Arkham Horror’s main failings are, and what I would do with it. I think Arkham Horror has just about the right number of elements to create an entertaining sandbox adventure with limited random generation. What I see as the main flaw in the basic game is too much randomness. While it’s entirely possible to have a series of plausible events unfold as though connected, it’s coincidental. Now offering a choice of death by Giant Space Flea, Giant Space Lobster, or the original flavor, Giant Space Space. In Arkham Horror (and by extension, the Mythos) you can rest assured you will be destroyed or driven mad by either A, the terrifying, encroaching darkness, or B, whatever you seek to defend yourself from the terrifying, encroaching darkness. Sometimes, rarely, your own strength will be enough, but it always costs you. What I’m trying to say is, while you will tend to be “gotten” by the bad guys one way or another, it is still almost always foreshadowed, and makes sense from a narrative perspective. You are not just randomly hit by a truck, you’re hit by a truck driven by a mi-go who was out to get you, or because you went insane from other stuff first. Right, lots of harping about “too much” randomness. One of the things that drives Arkham Horror forward is this sense of inevitability. Everything is getting worse, even when there are heroes actively fighting against it. You’re guaranteed the moment an investigator steps foot in town, the odds of destruction and failure are fifty-fifty at best. Encroaching doom or internal conflict. That is what I would take from this game. Things are always happening to move things along. A new Mythos card is drawn every turn, and something gets worse. Not just a calendar like Persona, and the events don’t have to be as random as Arkham Horror. They can be clues leading toward a single source. And all along, you are battling against external threats and internal conflicts – encroaching darkness and the lure of self-destruction. Rock and hard place.